Summer arrived this year on the west coast at 3:51 am, June 21st. The timing of the solstice depends on when the Sun reaches its farthest point north of the equator. The word solstice is from the Latin solstitium, fromsol (sun) and stitium (to stop), reflecting the fact that the Sun appears to stop at this time (and again at the winter solstice). In temperate regions, we notice that the Sun is higher in the sky throughout the day, and its rays strike Earth at a more direct angle, causing the efficient warming we call summer. This summer solstice is the day with the most hours of sunlight during the whole year. So, “what does this have to do with mushrooms?” you may ask. Well, with the days getting longer, the air will be getting warmer and therefore the soil warmer. 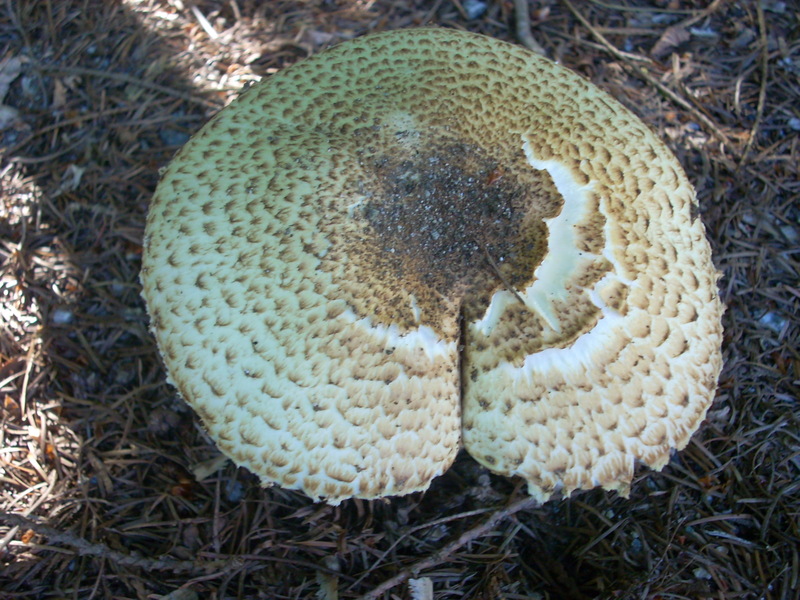 Temperature change is one of the cues for mushrooms to start fruiting, especially when the temperature change also is accompanied with moisture. The same is true when the air temperature and soil temperature cool in the fall. 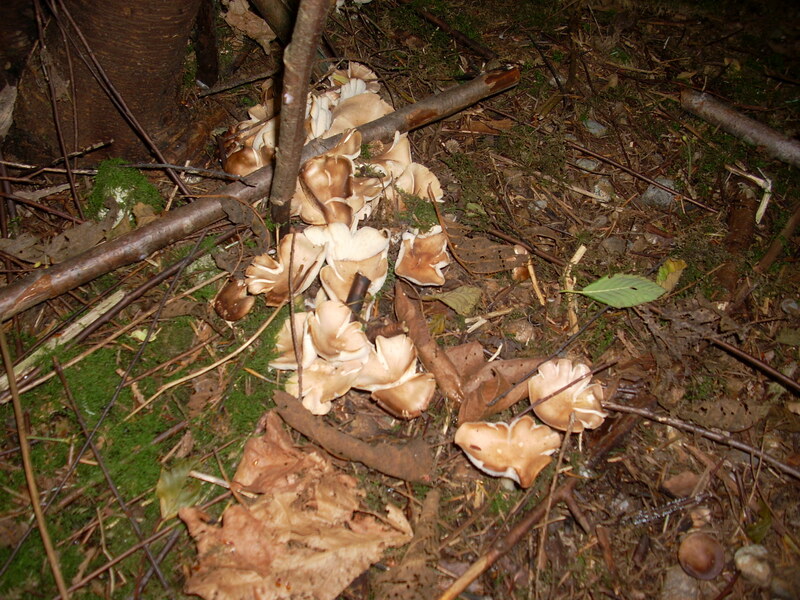 There are many other factors that are involved in the fruiting of mushrooms and I was hoping to be able to do a brief summary here on my blog. 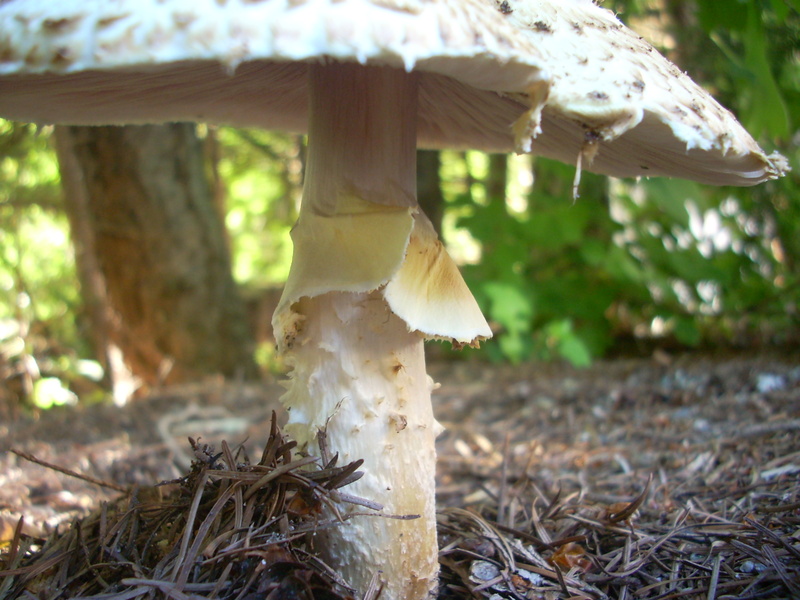 However, after reading several website, some fairly simplistic to others very scholarly and technical, it became even more confusing to try and pinpoint the factors that affect mushroom fruiting. Most talk about factors to be considered in the growing of mushrooms at home or commercially. I am more interested in understanding factors that affect the growth and fruiting of wild mushrooms. 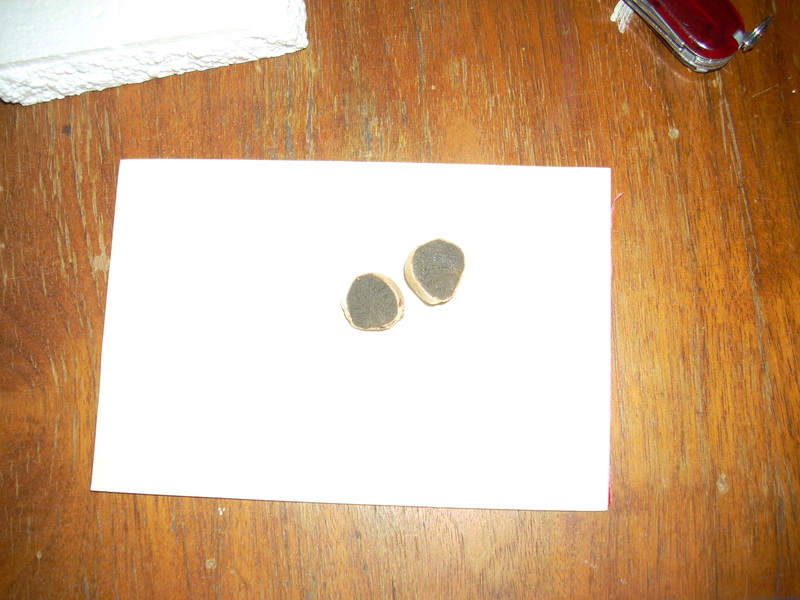 If you are interested in growing some of your own, this is one that I found.. http://www.wikihow.com/Grow-Mushrooms. But lets get back to why I started off talking about the Summer Solstice. My opinion is that many people have lost touch with the natural cycles of life and of nature. There was a time, not too long ago, when knowing when the sun reached it peak movement in the sky, could mean you lived another year or not. When to plant, when to reap, when to collect wild plants, when to slaughter your stock was determined by the cycles of sun, moon and stars. Modern life and contemporary culture has changed our need to be aware of the seasons. Today you can get almost anything you need or want, 24 hours a day at the local “super market”. We have become less interested int he seasons to know when to harvest or when to sow, and more interested in “hockey” or “football” season. Even those sports have changed, as you no longer need real outdoor ice on the pond or real grass to play on. Now we can sit in air conditioned domes, in our shirt sleeves and watch hockey until almost June. Our seasonal awareness has atrophied. Myself and other mycophiles know that with the coming of the solstice, the waning of the light will begin and soon the time of mushroom mania will soon be upon us. So what am I finding out there? In my last post I talked about the ripening of the berries. Just yesterday I had my first taste of some wild cherries and a couple of thimble berries. At home, my raspberries are just starting to ripen, about 2 or 3 weeks early. Not a great shot, but this I found growing at the base of some young firs. At first I thought it may be a truffle, due to it’s dense dark interior. 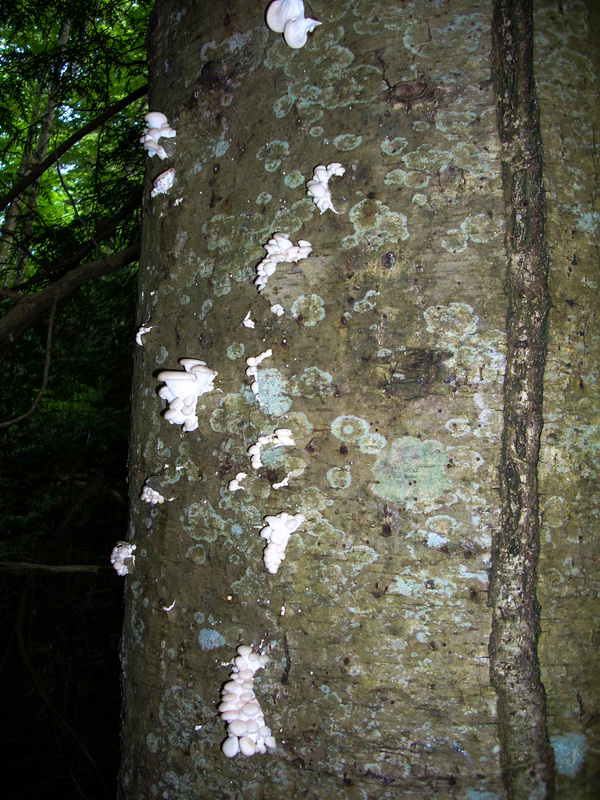 I imputed all the descriptors into Match Maker and came up with the following identification – Scleroderma areolatum. A puff ball of some sort. These next two shots I believe to be some kind of agaric, but could not do a positive ID. This last one I have found in great abundance in my back 40 the last three years. 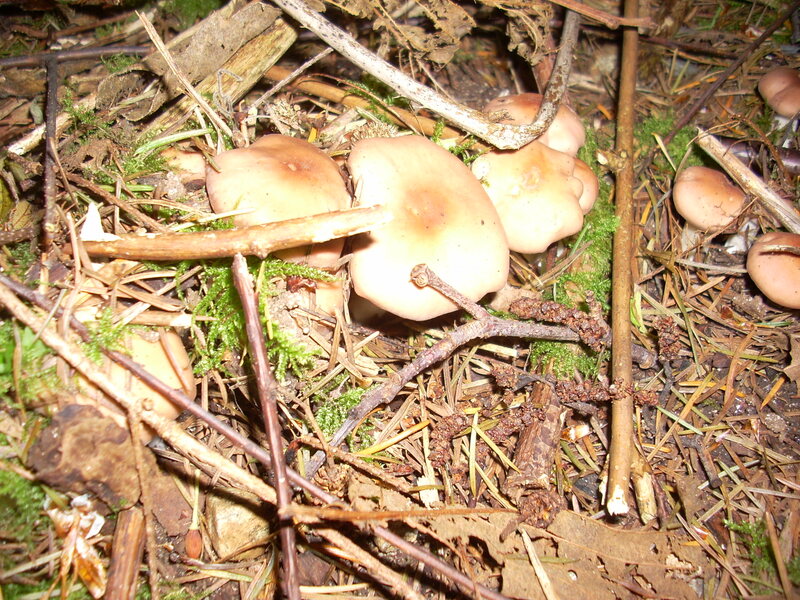 They grow in close clusters, usually in large fairy rings in the moss at the feet of young firs. At first I thought it may be the fried chicken or Lyophyllum decastes, but they normally fruit in late summer. I do have a patch of fried chicken mushrooms that I have picked for the last three years, and though they look similar, they have a distinctly different smell. Matchmaker came up with the name Rhodocollybia badiialba. I am still not convinced this is the correct ID. It has been dry but we have had rain the last day and more predicted for this coming weekend. I hope this precipitation will encourage some more fruiting. 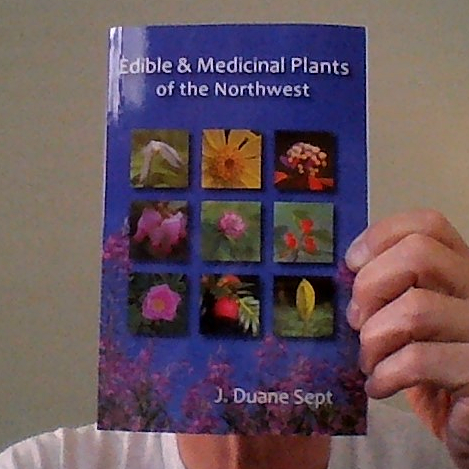 The other thing I want to talk about is a new book that I was gifted by Duane Sept titled – Edible & Medicinal Plants of the North West. Another very good field guide written and photographed Duane. The book is full of of great colour photographs and clear descriptions of the plants, their habitat and their uses. both culinary and medicinal. I highly recommend you get a copy. Finally, SCSHROOM is once again having a photo competition. If you are interested in entering, go to http://www.scshroom.org to get more information. Solstice has come, the days are warm and lazy, the grass is lush the birds are singing. Get out there and do some exploring, get the lay of the land for this fall when the days are shorter, but the mushrooms growing high. See you on the trails someday. Coastalshroomer. What to do on a rainy June day? After this nice long stretch of sunny and warm weather, waking this morning to the sound of rain coming down was a bit of surprise. What should I do today? Don’t need to water the garden, it’s too wet to do any weeding, why not have a second cup of tea and break open the new Fungi magazine and see what’s new in the mushroom world. 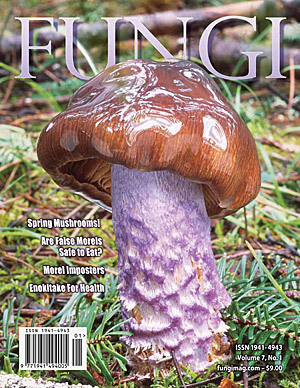 The cover this month has a photo of a beautiful Cortinarius vanduzerenis, courtsey of Taylor F. Lockwood. Lockwood is a world renowned photographer and mushroom aficionado. He will be the guest speaker and presenter this year at or SCHROOM festival this fall , happening in Pender Harbour, October 17-19, 2014. Stay tuned for more on this event later. You can check his work out at the following link http://www.mushroom.pro/. The other things I did today was to bottle my latest batch of beer. This always a good thing to do on a cool rainy day, in anticipation of the need for a nice cool one on a hot a sunny day. The next batch will be my medicinal mushroom, turkey tail/ganaderma tsugae red ale. I also decided to cleaned out the freezer and found a couple of packages of frozen raspberries and blackberries from last summer’s picking. Way at the bottom of the freezer I found a couple of bags of yellow plums. I decide to chuck them all in the vat, let them defrost, add some water, sugar and yeast and make a nice light “country” wine. Might be able to taste it by Christmas or next spring. The other thing I did was to write this blog. It’s getting easier each time I do it, however finding the time, when the weather is nice, and I would sooner be outside is the hard part. One big problem I have is finding mushrooms to photograph and write about. I know, I seem to find some every month, but my sightings of these beauties have been rather sparse so far. It could be that last year was such a productive year that this year, the mushrooms are a bit exhausted and are rebuilding their strength again. The scarcity may also be due to the early drought conditions we are having here on. the coast. I am forever hopeful that the bounty will come, especially when the rains come, like today and also forecast later this week. but they were beyond this best before dates. This year I want to find some in their prime, as I have yet to taste this one. Two more photo’s from last year. Keep looking, keep hoping for rain and sun in the right amounts, and maybe I will see you out on the trails one day. What a great spring it has been so far, warm sunny days and remarkably mild night as well. Kind of unusual to be able to sit out side, after sun down and not need a jacket and long pants! I think it was just a couple of years ago when we had a horrible wet and cold spring. People were calling it June-uary. Here on the coast things can change just like “that”, but hold on, let’s not tempt the gods to do just that, we will leave it alone and be humble and thankful for the nice weather. Living at the extreme latitudes, things are different. During the summer, the sun never sets and in the dead of winter, barely gets above the horizon. The ancients also began to track the sun, and noticed that if you coincidentally planted crops at certain times of the sun’s cycle, they grew better. As well, when the sun was at another place in the sky, certain animals appeared on the tundra and birds in the sky, and not to forget certain mushrooms, both culinary and ones that helped you commune with the gods. Good and bad, yen and yang, in the end it is all superstition, but they were connected to their world and to nature. Many of us aren’t connected to the land, so these annual celestial events don’t really mean very much. Once we step out of the city and into the woods, that primal experience is there and so is the wonder I suppose. But I digress, I was suppose to be talking about mushrooms, so here I go. Now all we need is a bit more rain and these little darlings will plump up real nicely. Today, however, I was looking for other things to forage besides mushrooms. What? Other things? Yes… right now not much in the way of the fungi family is coming up and the prediction is for another hot and dry summer. This means if we get no rain in late summer, we may have slim pickens this fall. We many need some other things to flavour our meals as we wait out those long and dark winter days. So, while you are out there looking, see what else you can bring home. Most of you know who live here on the coast are well aware of the black berry which starts to show it’s beautiful dark blue-black fruit in late July or early August. From those, you can make the best jams and jellies,but my favorite is black berry wine. There are also several other berries indigenous to the coastal forests, also delicious and very common. Just now I am starting to see the Salmon berry starting to ripen. They come in two colours, a bright red cluster, the same colour as salmon eggs and a golden variety. No pictures yet, but later this month. Also soon to arrive will be the red huckleberry. We pick pounds of them and mix with raspberries or with red currents to make a beautiful crimson jelly. Our Swedish son-in-law tells us they are similar in taste to the lingon berry found in Scandinavia. There is also a blue huckleberry that my neighbour picks high in the coastal mountains. She has a special “sercret” patch that she visits every year to pick these berries and makes fantastic pies out of. A much under valued and I think delicious berry is the thimble berry. Again, my Swedish son in-law nailed the taste… he describes it as tasting like rhubarb. Sweeter than rhubarb, but rhubarb. 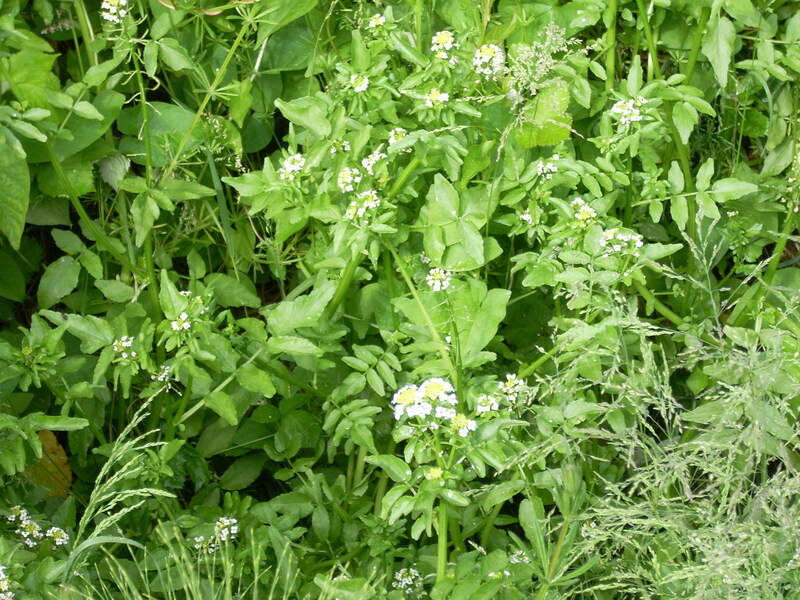 Besides the berries there also wild herbs and plants, many medicinal and also very tasty. Delicious, peppery and fresh, used in a salad or to make a great green pesto as you wait for your basil to get big enough. Last week Chris picked a number of buds, like the one in the upper left corner of this picture. She put them in a shallow bowl and as they slowly dried out, they gave up their beautiful perfume. Come the fall, and early winter the rose hips will be ready to pick and use to make jelly or dried and made into a tea. 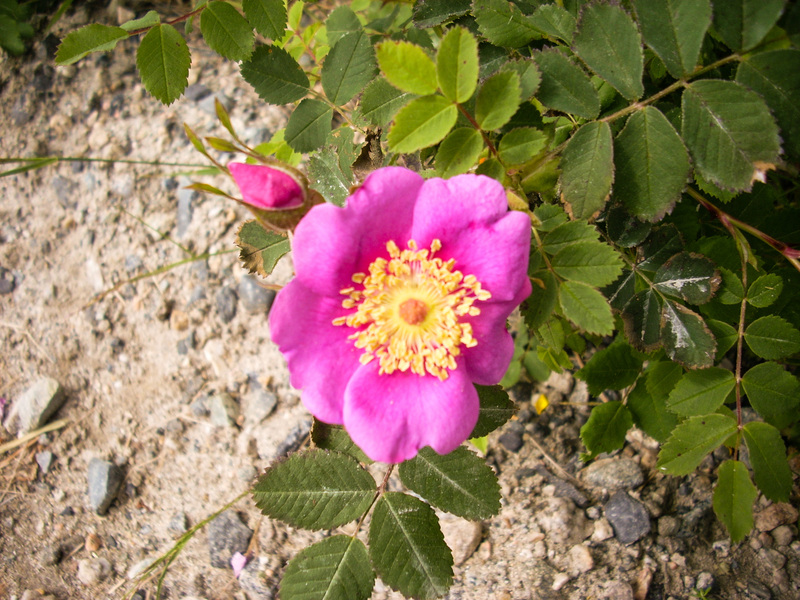 Rose hips have incredible amounts of vitamin C, which prevents scurvy and is a great antioxidant. That’s the flora, but this year it’s the fauna that I am also seeing more of, especially these guys.. 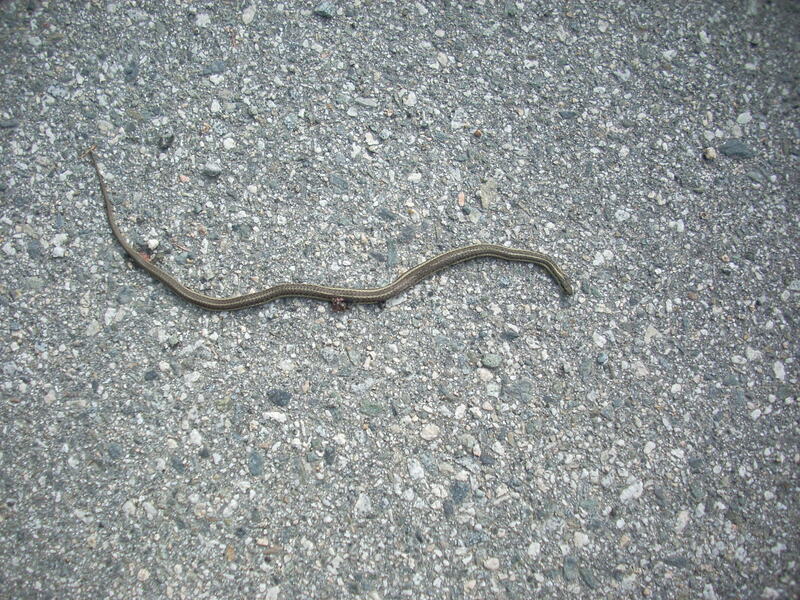 I have seen more garter snakes this spring then I have since I was a kid in Saskatchewan. Anybody know if this is a good sign? Likely it is as reptiles and amphibians are very sensitive to environmental degradation, so to see a lot of them means things are pretty healthy in my neighborhood. I see quite a number of these all year round. 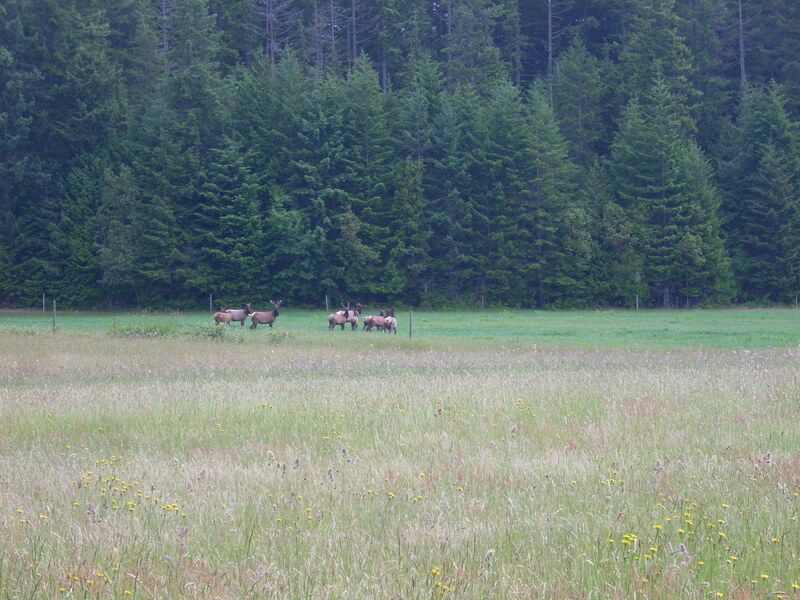 They at first were not sure what to make of me, nor I of them, as there was a large buck in the group. I whistled and they put their heads back and trotted off into the woods. That’s a lot of organic, wild meat on the hoof there. I haven’t hunted since I was a kid, and don’t know if I have gotten too soft to “harvest” me one of these critters. ( interesting euphemism, to protect the sensitive). I do have hunter friends and have no problem with them doing it, or me enjoying the steaks. I will keep my harvesting to the fungi and botanical families for now. 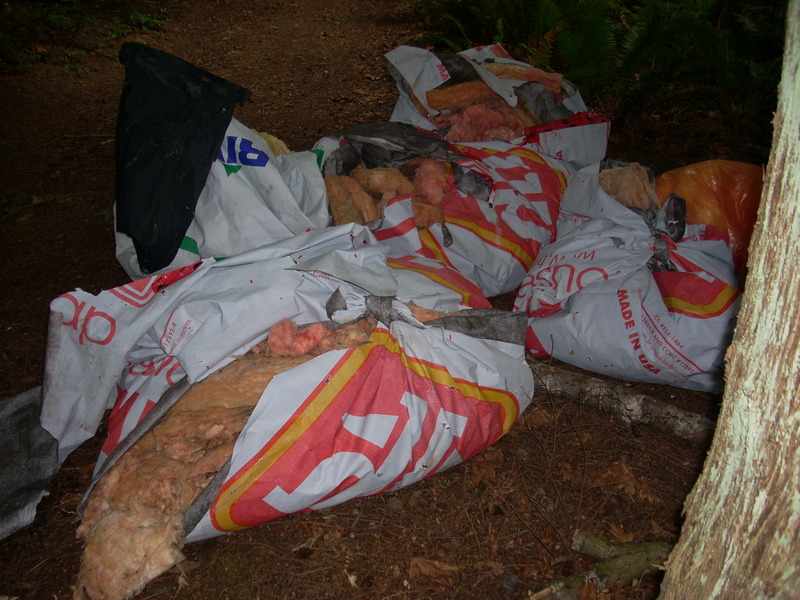 Four bags of used pink fiberglass insulation. I also saw garbage bags chucked into the woods. Illegal dumping! Be-spoiling the beauty of the wilderness. I just don’t understand it. How did they even get it there? On the back of a quad? 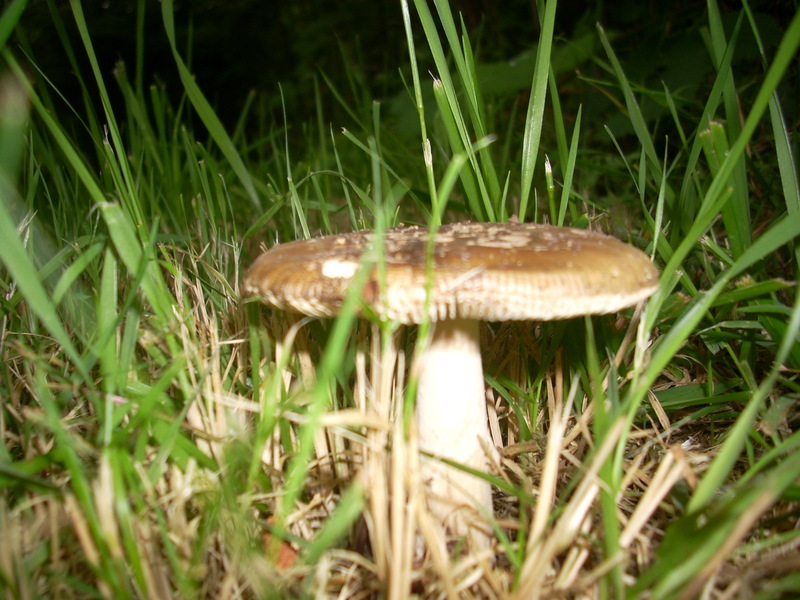 I have checked my last few year’s diaries and it seems that what should be coming up this month are some of the agarics, such as the prince, as well as an the shaggy grey parasol. I am forever hopeful! Good hunting to you and hope to run into in the woods some times.